It’s still late starts for imaging during most of August, but beginning to get reasonable again for those of us that have to go along to the day job next morning. This Month’s object is a beautiful region of (blue) reflection nebulosity in a sea of red (emission nebulosity) that is the Gamma Cygni region of Cygnus. Surrounding the central star Sadr in Cygnus is a truly massive region of emission nebulosity, which can appear a little boring with its uniform red appearance. 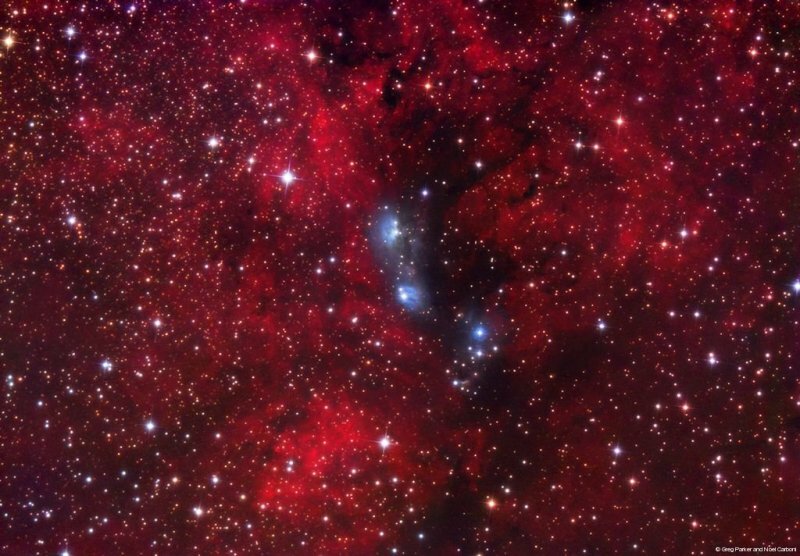 However, towards the North of this region we hit a little blue gem that breaks up the monotonous red – and this is the reflection nebula NGC6914. My notes say that I started imaging this one around 10:30 p.m. so that’s not too late to start grabbing data, but it is an object needing around 4 hours total with the Hyperstar and preferably in excess of 12 hours with something like an f#4.5 instrument. Sub-exposure times of at least 5-minutes with the Hyperstar and at least 10-minutes with the Sky 90 are recommended. Get in enough quality data and you’ll be rewarded by one of the prettiest images you’ll find in an emission nebula. Beautifull Image Greg, Just wondering what filters you are using with your hyperstar setup as I know you too struggle with light polution and im amazed your able to go 5 minutes, right now I seem to be limited to about 1:30 maximum before the sky background takes over, do you ever allow sky background to saturate the image and fix it within processing? I use a 2″ Hutech IDAS light pollution filter from SCS astro which seems to work pretty well even at f#2. In fact I have taken 30-minute subs with the Hyperstar (for M33) and didn’t have bad sky background problems. Sorry for all the questions, im quite new to the hyperstar and though I’ve been massively impressed with the images I’ve been able to obtain, I’d love to go deeper with the images but always felt I was hitting a wall with the light polution here. The IDAS filter really does cut out my background light pollution (mostly sodium street lights), so I have not got near my “limit” of 10% full well for the background. I think going up to 10% will probably be manageable, but I think I’m around 5% or less most of the time. Hi Greg, thanks for the reply, Bern at Modern Astronomy shall be expecting a call soon!